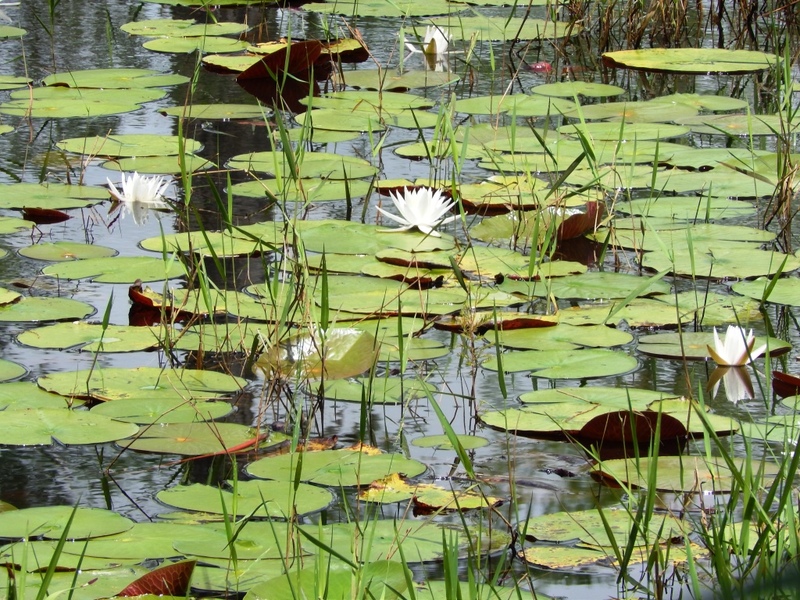 Excess aquatic weeds can be a source of frustration for pond owners. Privately owned ponds and lakes are common across the Panhandle. Ponds can be a source of great enjoyment and frustration for their owners. When all is well a pond is a welcome addition to most any landscape. However, when problems arise pond owners are often times at a loss for how to rectify the situation. Unwanted or excess weeds in a pond is a one of the most common frustrations for pond owners. Luckily, aquatic weed control, an otherwise daunting task, can be manageable if some basic principles are understood. 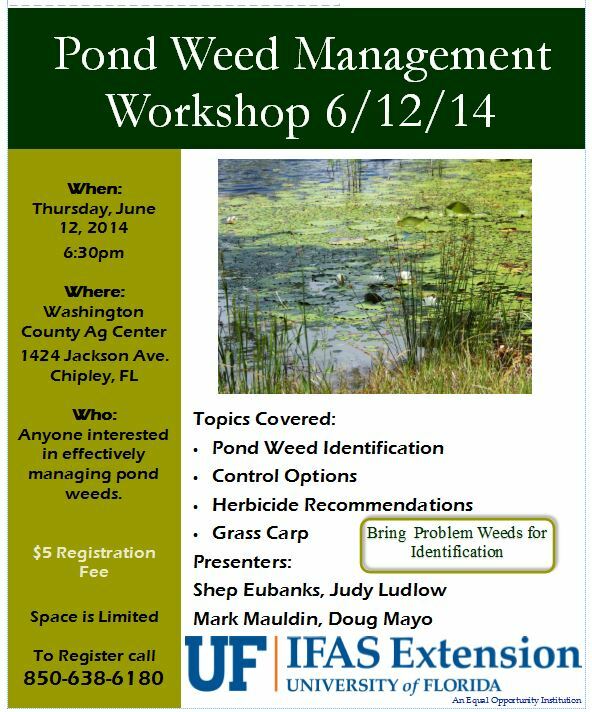 UF/IFAS extension faculty from Calhoun, Holmes, Jackson, and Washington counties will be presenting a workshop on Thursday, June 12th to help educate pond owners regarding some of the principles of effectively controlling unwanted weeds in their ponds. Topics covered will include pond weed identification, weed control options, aquatic herbicide selection and application, and the use of grass carp for weed control. 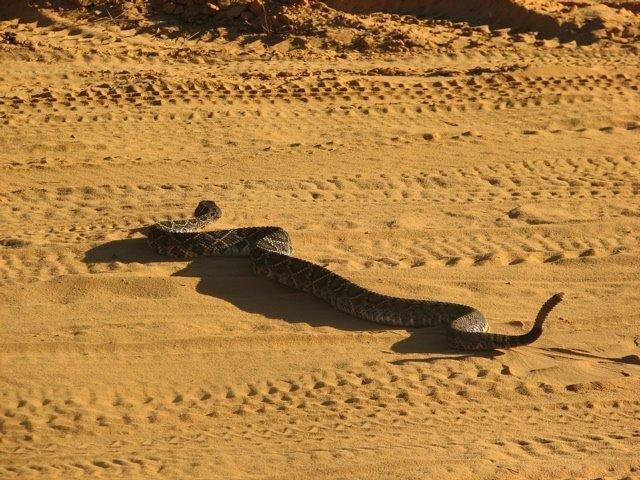 Warming temperatures have awaken snakes that have been dormant during the winter months. As a result, they are more active during abnormal times of the day and move more than they typically do while searching for food. This also means more people are likely to encounter with them. Even though most snakes are nonvenomous, many people fear them and will go out of their way to kill them if an encounter occurs. Interestingly, 95% of the humans bitten by snakes are either trying to catch or kill them; suggesting the best thing to do when encountering a snake is to leave it be. How can you reduce your chance of encountering a snake? Most snakes found around the house are either seeking suitable habitat or food. Anything that could attract rodents or amphibians could attract snakes. 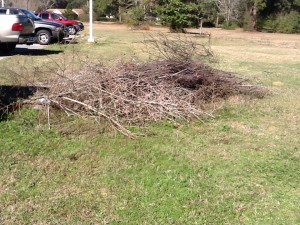 Overgrown landscaping, trash or brush piles, bird feeders, water features, garbage, and greenhouses are examples of snake attractants many people have. To reduce your chance of an encounter you should move such items away from the house, and for those that you cannot – keep as clean as you can. 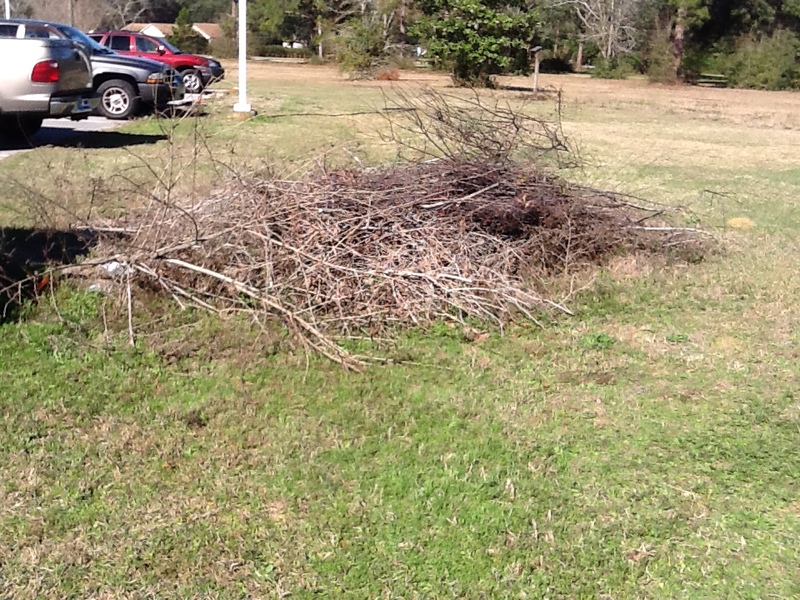 Snakes do not like to cross short grass, so a frequently mowed yard helps as well. 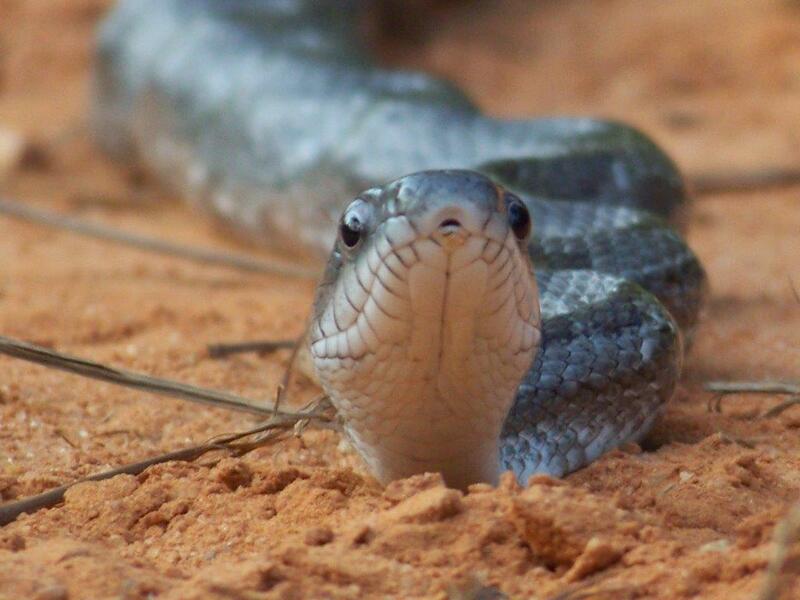 If you live near good snake habitat you may have to invest in silt fencing, or a similar product, that has a slick surface which is difficult to crawl over. If placing silt fencing along the boundary you should have the wooden stakes on your side of the fence; snakes can climb these. The first thing you should understand is that, like most animals, there is a zone around snakes in which they feel threatened. When they detect you, they react as if you are the predator. If you are outside their zone they will remain motionless. If you cross the line, they will try to move away to avoid being attacked. If they have nowhere to move they will turn and defend themselves; this could mean a strike. If a snake is encountered, try not to move towards the snake and if you are already close try to give the animal an escape route. Many will want to know if the snake is venomous. Of the 46 species and subspecies of snakes in our state only six are venomous. 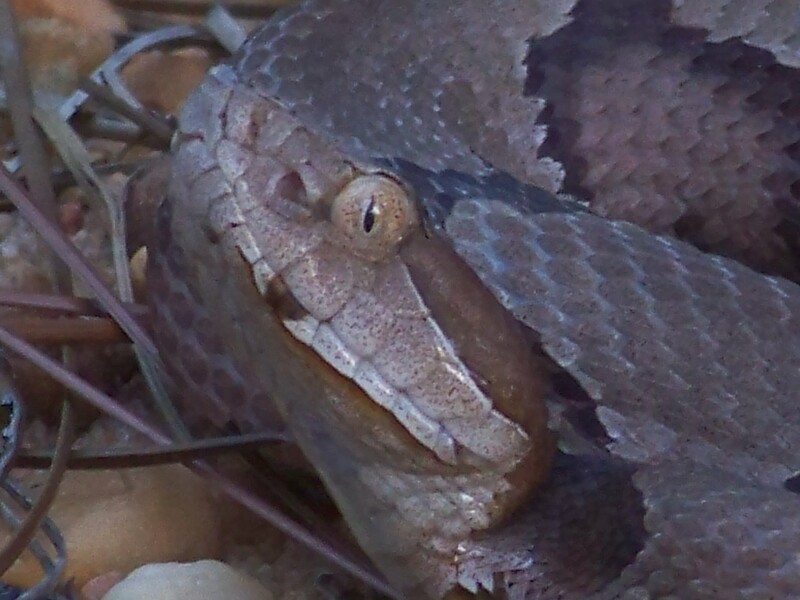 Of these, five belong to the family Viperidae and can be identified by the elliptical eye pupil, the triangle-shaped head, and the second set of nostrils (pits) on the snout. These include the three species of rattlesnakes, the moccasin, and the copperhead. One venomous snake, the Eastern Coral Snake, does not have the appearance of a viper. The coloration of this snake is red, yellow and black with red touching yellow. They also differ from their kingsnake mimics by having a black head. If the unfortunate happens and a snake bites you, the first thing you should do is not get bit twice. Many people react by trying to kill the snake and multiple bites can happen. Nonvenomous bites should be washed with warm water and soap. If the bite is from a viper, remember–do not get bit twice. With venomous snakes many feel the hospital will need the snake for identification of the proper antivenin. This is not necessary and, again, could lead to multiple bites. Viper bites can be extremely painful and, if venom is injected, can induce severe swelling. You should remove rings, watches, or any garment that may impede swelling. Many of the traditional first aid treatments for snake bites can cause more harm than the bite. It is recommended that you hold the bite below heart level if possible and calmly go to the hospital. Coral snake bites are often undetected but are very serious and medical attention is needed. As we approach spring, locals should be aware that the Florida Fish and Wildlife Conservation Commission is trying to track three species of local snakes; the Eastern Diamondback Rattlesnake, the Florida Pine Snake, and the Southern Hognose. If you think you see one of these FWC would like to know. A GPS mark and photograph is needed. You can find the log site at FWC’s website: www.MyFWC.com. For more information on snakes, contact your local County Extension Office. Digital devices have proliferated like kudzu in July, and new user applications for these devices are as common as armadillos. Untold hours and dollars are being spent by couch potatoes to defend artificial worlds from dragons, zombies and other imaginary invaders. Meanwhile, real exotic aliens from air potatoes to monitor lizards are invading Florida. Don’t panic; there is some good news. A group of new applications that can help citizen scientists identify, locate and manage invasive plant and animal species in Florida is available for free. The first line of defense is identifying and mapping new occurrences of invasive species. Many, if not most, new infestations were established before anyone noticed or cataloged them, and effective control strategies depend on knowing the extent of new infestations. “IveGot1” was developed by this same group through a cooperative agreement with the National Park Service in cooperation with the Florida Fish and Wildlife Conservation Commission and the University of Florida Center for Aquatic and Invasive Plants. The application is now available on both Apple and Android operating systems. The app includes invasive plants and animals and allows direct reporting of sightings as well as back ground information on Florida’s most common invasive species. At least two other apps useful for invasive species management are also available. “Invasive Plants in Southern Forests” is adapted from the US Forest Service book of the same name. This publication is available for download at http://www.srs.fs.usda.gov/pubs/gtr/gtr_srs062, but it’s a big file (33MB). In addition to its ID function, the app includes appropriate control methods for the over 100 invasive trees, shrubs, vines, grasses and forbs described. As of now, this application is only available for the iPhone platform. The second app is for Florida’s most widespread invasive animal. Although pythons may be our most infamous invasive animal, they don’t have the distribution of the wild hog. 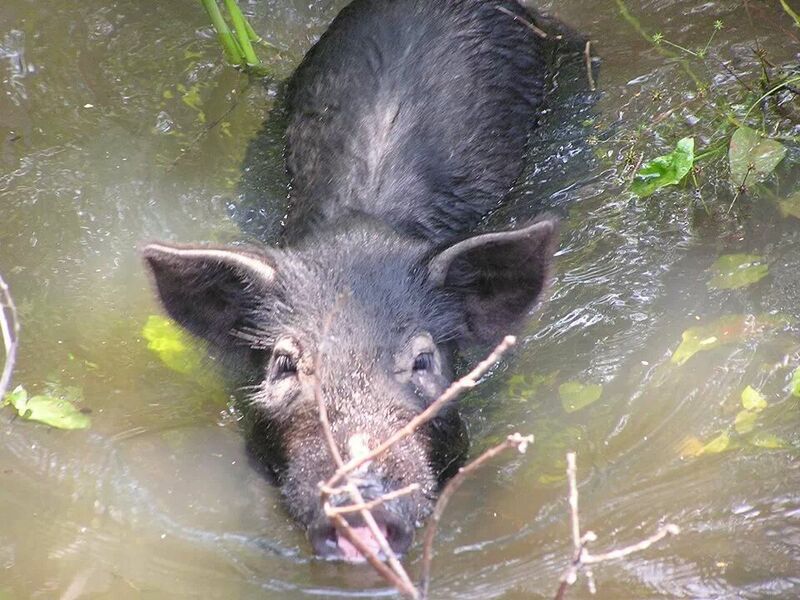 “Squeal on Pigs” combines a location app and educational information to support states’ efforts to control wild hog populations and reduce their impacts on streams and crops. Maybe you won’t reach Destroyer level in the real battle on air potatoes and Florida’s other invasive species, but moving from Angry Birds to Squeal on Pigs will raise your power level as a Friend of Real Florida.